Stand next #TOTHEBRAVE and be part of a global campaign against childhood cancer! Wear the t-shirt and join Messi & the rest of the @TheBravestTeam to raise funds to build the SJD Pediatric Cancer Centre to serve all the children in the world. 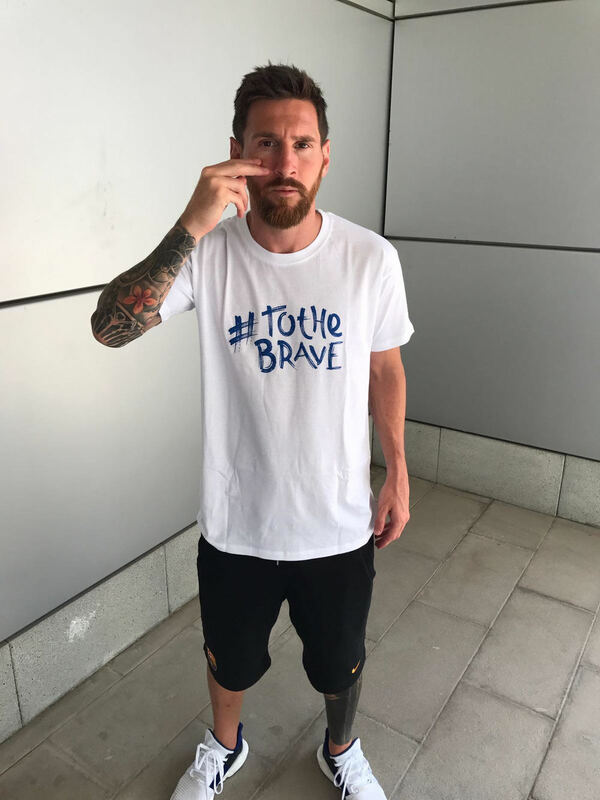 Apoya #TOTHEBRAVe y únete a este movimiento global contra el cancer infantil ! . La camiseta To THe Brave de edición limitada es la manera de ayudar, tanto para los donantes habituales como para los nuevos, a los niños en su batalla diaria contra el cancer. Stand next #TOTHEBRAVE and join the global movement against childhood cancer! This limited edition To The Brave T-shirt is the newest way for both repeat and first time donors to become involved in the lives of the brave children living with childhood cancer. When you purchase this limited edition To The Brave T-shirt, you’ll know that the proceeds from the campaign will go to helping fund the fight against children’s cancer. This money will help build the new Children’s Oncology Center at SJD Hospital in Barcelona. Design © 2017 Line Sports And Entertainment, S.L. All rights reserved. This design, including all phrases, art, photography, and graphics, may not be sold, reproduced, displayed, modified or distributed without the express prior written permission of the copyright holder. NOTICE: Line Sports And Entertainment, S.L. asserts its rights against the producers and distributors of infringing reproductions.